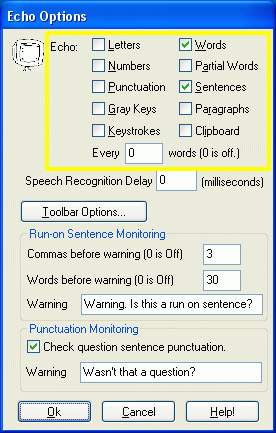 Echo offers a number of features for reading back what you are typing as you type. This is a great help for catching errors since many people have trouble recognizing errors when they see them, but have no problem if they hear them. Through the Echo options dialog, you can control each of the things that Echo reads back to you so that you get exactly the feedback you need. One nice feature for people who have trouble with punctuation is the "Every n Words" option which reads back what you type every so many words. This gives people who don't use punctuation the option of more than just single word feedback.